In meiosis I, the first round of meiosis, homologous chromosomes exchange DNA and the diploid cell is divided into two haploid cells. Meiosis is preceded by interphase which consists of the G1 phase (growth), the S phase ( DNA replication), and the G2 phase. During prophase I, the homologous chromosomes condense and become visible as the x shape we know, pair up to form a tetrad, and exchange genetic material by crossing over. During prometaphase I, microtubules attach at the chromosomes’ kinetochores and the nuclear envelope breaks down. In metaphase I, the tetrads line themselves up at the metaphase plate and homologous pairs orient themselves randomly. In anaphase I, centromeres break down and homologous chromosomes separate. In telophase I, chromosomes move to opposite poles; during cytokinesis the cell separates into two haploid cells. Meiosis is preceded by an interphase consisting of three stages. The G1 phase (also called the first gap phase) initiates this stage and is focused on cell growth. The S phase is next, during which the DNA of the chromosomes is replicated. This replication produces two identical copies, called sister chromatids, that are held together at the centromere by cohesin proteins. The centrosomes, which are the structures that organize the microtubules of the meiotic spindle, also replicate. Finally, during the G2 phase (also called the second gap phase), the cell undergoes the final preparations for meiosis. During prophase I, chromosomes condense and become visible inside the nucleus. 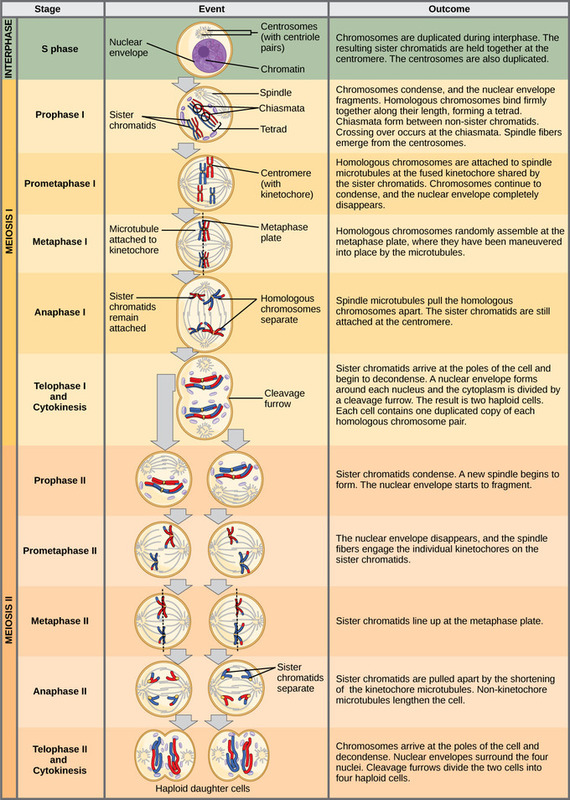 As the nuclear envelope begins to break down, homologous chromosomes move closer together. The synaptonemal complex, a lattice of proteins between the homologous chromosomes, forms at specific locations, spreading to cover the entire length of the chromosomes. The tight pairing of the homologous chromosomes is called synapsis. In synapsis, the genes on the chromatids of the homologous chromosomes are aligned with each other. The synaptonemal complex also supports the exchange of chromosomal segments between non-sister homologous chromatids in a process called crossing over. The crossover events are the first source of genetic variation produced by meiosis. A single crossover event between homologous non-sister chromatids leads to an exchange of DNA between chromosomes. Following crossover, the synaptonemal complex breaks down and the cohesin connection between homologous pairs is also removed. At the end of prophase I, the pairs are held together only at the chiasmata; they are called tetrads because the four sister chromatids of each pair of homologous chromosomes are now visible. 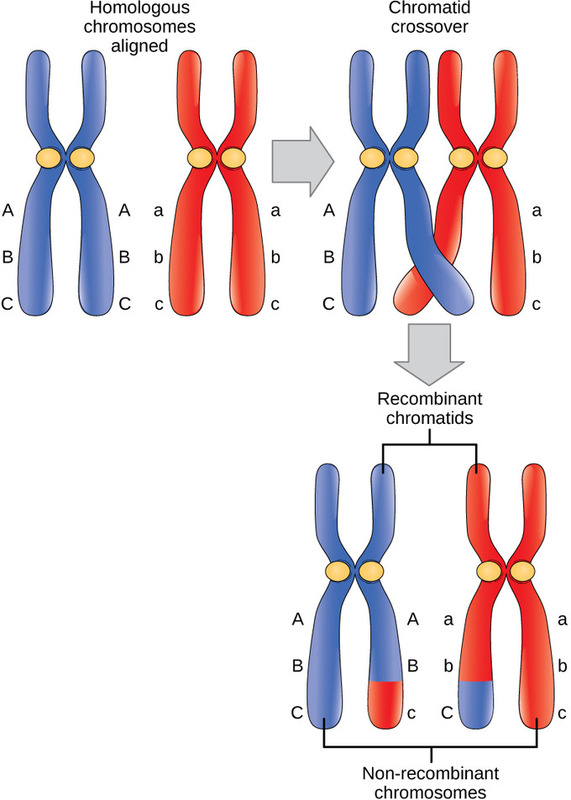 Crossover between homologous chromosomes: Crossover occurs between non-sister chromatids of homologous chromosomes. The result is an exchange of genetic material between homologous chromosomes. Synapsis holds pairs of homologous chromosomes together: Early in prophase I, homologous chromosomes come together to form a synapse. The chromosomes are bound tightly together and in perfect alignment by a protein lattice called a synaptonemal complex and by cohesin proteins at the centromere. The key event in prometaphase I is the formation of the spindle fiber apparatus where spindle fiber microtubules attach to the kinetochore proteins at the centromeres. Microtubules grow from centrosomes placed at opposite poles of the cell. The microtubules move toward the middle of the cell and attach to one of the two fused homologous chromosomes at the kinetochores. At the end of prometaphase I, each tetrad is attached to microtubules from both poles, with one homologous chromosome facing each pole. In addition, the nuclear membrane has broken down entirely. During metaphase I, the tetrads move to the metaphase plate with kinetochores facing opposite poles. The homologous pairs orient themselves randomly at the equator. This event is the second mechanism that introduces variation into the gametes or spores. In each cell that undergoes meiosis, the arrangement of the tetrads is different. The number of variations is dependent on the number of chromosomes making up a set. There are two possibilities for orientation at the metaphase plate. The possible number of alignments, therefore, equals 2n, where n is the number of chromosomes per set. Given these two mechanisms, it is highly unlikely that any two haploid cells resulting from meiosis will have the same genetic composition. Meiosis I ensures unique gametes: Random, independent assortment during metaphase I can be demonstrated by considering a cell with a set of two chromosomes (n = 2). In this case, there are two possible arrangements at the equatorial plane in metaphase I. The total possible number of different gametes is 2n, where n equals the number of chromosomes in a set. In this example, there are four possible genetic combinations for the gametes. With n = 23 in human cells, there are over 8 million possible combinations of paternal and maternal chromosomes. In anaphase I, the microtubules pull the attached chromosomes apart. The sister chromatids remain tightly bound together at the centromere. The chiasmata are broken in anaphase I as the microtubules attached to the fused kinetochores pull the homologous chromosomes apart. In telophase I, the separated chromosomes arrive at opposite poles. In some organisms, the chromosomes decondense and nuclear envelopes form around the chromatids in telophase I. Then cytokinesis, the physical separation of the cytoplasmic components into two daughter cells, occurs without reformation of the nuclei. In nearly all species of animals and some fungi, cytokinesis separates the cell contents via a cleavage furrow (constriction of the actin ring that leads to cytoplasmic division). In plants, a cell plate is formed during cell cytokinesis by Golgi vesicles fusing at the metaphase plate. This cell plate will ultimately lead to the formation of cell walls that separate the two daughter cells. 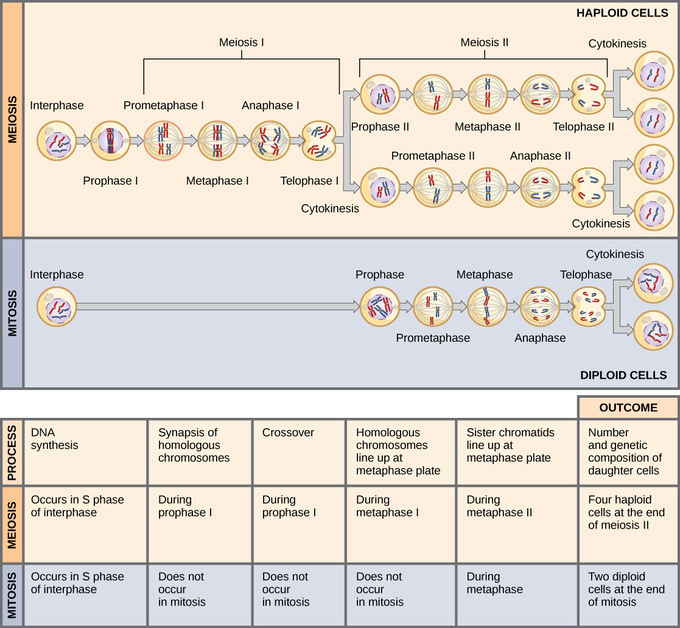 Two haploid cells are the end result of the first meiotic division. The cells are haploid because at each pole there is just one of each pair of the homologous chromosomes. Therefore, only one full set of the chromosomes is present. 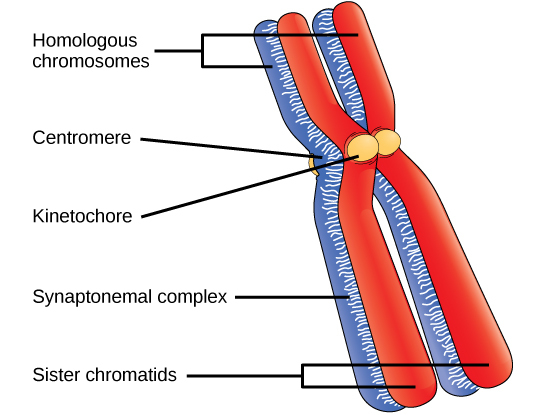 Although there is only one chromosome set, each homolog still consists of two sister chromatids. During meiosis II, the sister chromatids within the two daughter cells separate, forming four new haploid gametes. During prophase II, chromsomes condense again, centrosomes that were duplicated during interphase I move away from each other toward opposite poles, and new spindles are formed. During prometaphase II, the nuclear envelopes are completely broken down, and each sister chromatid forms an individual kinetochore that attaches to microtubules from opposite poles. During metaphase II, sister chromatids are condensed and aligned at the equator of the cell. During anaphase II sister chromatids are pulled apart by the kinetochore microtubules and move toward opposite poles. During telophase II and cytokinesis, chromosomes arrive at opposite poles and begin to decondense; the two cells divide into four unique haploid cells. Meiosis II initiates immediately after cytokinesis, usually before the chromosomes have fully decondensed. In contrast to meiosis I, meiosis II resembles a normal mitosis. In some species, cells enter a brief interphase, or interkinesis, before entering meiosis II. Interkinesis lacks an S phase, so chromosomes are not duplicated. The two cells produced in meiosis I go through the events of meiosis II together. During meiosis II, the sister chromatids within the two daughter cells separate, forming four new haploid gametes. The mechanics of meiosis II is similar to mitosis, except that each dividing cell has only one set of homologous chromosomes. If the chromosomes decondensed in telophase I, they condense again. If nuclear envelopes were formed, they fragment into vesicles. The centrosomes that were duplicated during interphase I move away from each other toward opposite poles and new spindles are formed. The nuclear envelopes are completely broken down and the spindle is fully formed. Each sister chromatid forms an individual kinetochore that attaches to microtubules from opposite poles. Meiosis I vs. Meiosis II: The process of chromosome alignment differs between meiosis I and meiosis II. In prometaphase I, microtubules attach to the fused kinetochores of homologous chromosomes, and the homologous chromosomes are arranged at the midpoint of the cell in metaphase I. In anaphase I, the homologous chromosomes are separated. In prometaphase II, microtubules attach to the kinetochores of sister chromatids, and the sister chromatids are arranged at the midpoint of the cells in metaphase II. In anaphase II, the sister chromatids are separated. The chromosomes arrive at opposite poles and begin to decondense. Nuclear envelopes form around the chromosomes. Cytokinesis separates the two cells into four unique haploid cells. At this point, the newly-formed nuclei are both haploid. The cells produced are genetically unique because of the random assortment of paternal and maternal homologs and because of the recombining of maternal and paternal segments of chromosomes (with their sets of genes) that occurs during crossover. Complete Stages of Meiosis: An animal cell with a diploid number of four (2n = 4) proceeds through the stages of meiosis to form four haploid daughter cells. Mitosis and meiosis share some similarities, but also some differences, most of which are observed during meiosis I. For the most part, in mitosis, diploid cells are partitioned into two new diploid cells, while in meiosis, diploid cells are partitioned into four new haploid cells. In mitosis, the daughter cells have the same number of chromosomes as the parent cell, while in meiosis, the daughter cells have half the number of chromosomes as the parent. The daughter cells produced by mitosis are identical, whereas the daughter cells produced by meiosis are different because crossing over has occurred. The events that occur in meiosis but not mitosis include homologous chromosomes pairing up, crossing over, and lining up along the metaphase plate in tetrads. Meiosis II and mitosis are not reduction division like meiosis I because the number of chromosomes remains the same; therefore, meiosis II is referred to as equatorial division. When the homologous chromosomes separate and move to opposite poles during meiosis I, the ploidy level is reduced from two to one, which is referred to as a reduction division. Mitosis and meiosis are both forms of division of the nucleus in eukaryotic cells. They share some similarities, but also exhibit distinct differences that lead to very different outcomes. The purpose of mitosis is cell regeneration, growth, and asexual reproduction,while the purpose of meiosis is the production of gametes for sexual reproduction. Mitosis is a single nuclear division that results in two nuclei that are usually partitioned into two new daughter cells. The nuclei resulting from a mitotic division are genetically identical to the original nucleus. They have the same number of sets of chromosomes, one set in the case of haploid cells and two sets in the case of diploid cells. In most plants and all animal species, it is typically diploid cells that undergo mitosis to form new diploid cells. In contrast, meiosis consists of two nuclear divisions resulting in four nuclei that are usually partitioned into four new haploid daughter cells. The nuclei resulting from meiosis are not genetically identical and they contain one chromosome set only. This is half the number of chromosome sets in the original cell, which is diploid. 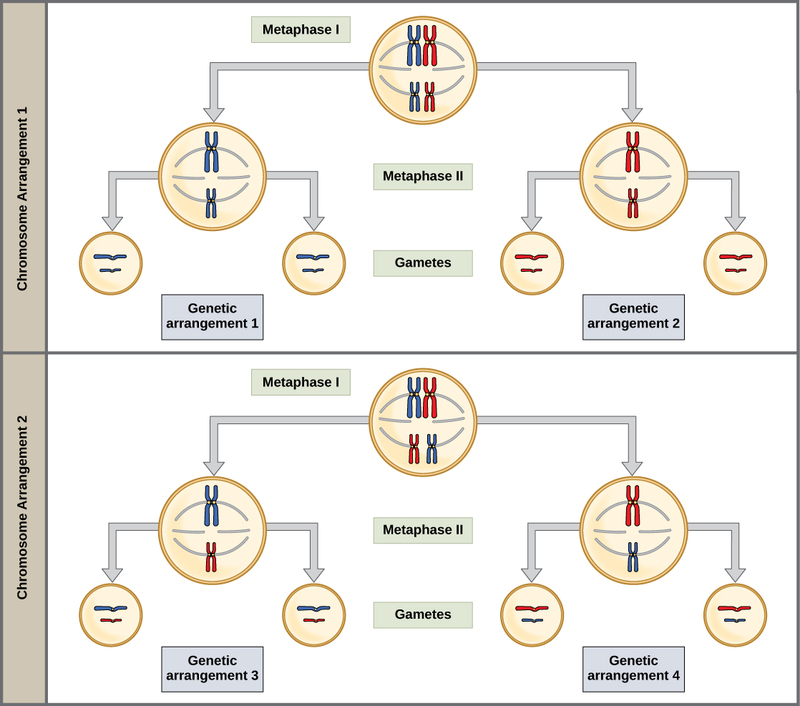 Comparing Meiosis and Mitosis: Meiosis and mitosis are both preceded by one round of DNA replication; however, meiosis includes two nuclear divisions. The four daughter cells resulting from meiosis are haploid and genetically distinct. The daughter cells resulting from mitosis are diploid and identical to the parent cell. The main differences between mitosis and meiosis occur in meiosis I. In meiosis I, the homologous chromosome pairs become associated with each other and are bound together with the synaptonemal complex. Chiasmata develop and crossover occurs between homologous chromosomes, which then line up along the metaphase plate in tetrads with kinetochore fibers from opposite spindle poles attached to each kinetochore of a homolog in a tetrad. All of these events occur only in meiosis I. When the tetrad is broken up and the homologous chromosomes move to opposite poles, the ploidy level is reduced from two to one. For this reason, meiosis I is referred to as a reduction division. There is no such reduction in ploidy level during mitosis. Meiosis II is much more similar to a mitotic division. In this case, the duplicated chromosomes (only one set, as the homologous pairs have now been separated into two different cells) line up on the metaphase plate with divided kinetochores attached to kinetochore fibers from opposite poles. 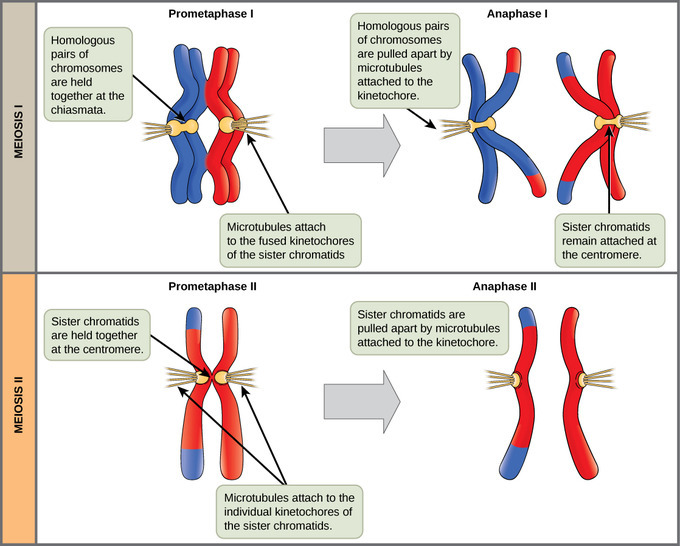 During anaphase II and mitotic anaphase, the kinetochores divide and sister chromatids, now referred to as chromosomes, are pulled to opposite poles. The two daughter cells of mitosis, however, are identical, unlike the daughter cells produced by meiosis. They are different because there has been at least one crossover per chromosome. Meiosis II is not a reduction division because, although there are fewer copies of the genome in the resulting cells, there is still one set of chromosomes, as there was at the end of meiosis I. Meiosis II is, therefore, referred to as equatorial division.